My title is taken from Donald Bloesch’s book, which is one of the best books on the subject. I want to mention here that in my view the best book on prayer is either Prayer by John Bunyan, or How to Pray by R. A. Torrey. Both books get to the heart of what it is to pray, though Torrey hits the nail on the head more quickly than the great Puritan. 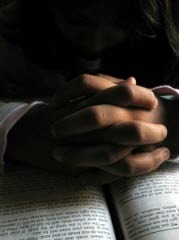 Prayer is the most important aspect of the Christian’s daily life. Above all else we should be praying Christians. I do not pretend to know all its mysteries, nor indeed do I think we need such information in order to pray. I do not understand how my computer works, but that does not stop me from typing out this meditation on it! God has not whisked us off to heaven the moment He saved us. He has left us to represent Him in “this present evil world” (Gal. 1:2); at least for a time. Since we remain here and are not immediately in God’s heavenly presence, our communication with the Father, Son and Holy Spirit cannot be like our communications with other people. When conversing with others we can hear their voice or read their words directed to us. There is a clear sense of reciprocation based upon sight and sound. But God has not called us to walk by sight, but by faith. Faith does not have five senses to tell us we’re in contact. Rather, faith trusts, and prayer articulates that trust in its constant reaching out to the God who is there. The kind of trust which faith exercises depends upon the understanding of God we have before our mind’s eye. God’s character is holy, just, gracious, loving, faithful, and true. He deigns to call us His children in Christ. We must always have this in mind when we pray. We pray to a good God, and it is He who has ordained prayer. Prayer is a gift of God. Because these things are true all our petitions to the throne of grace must be brought with thanksgiving. We must always acknowledge the great character of the Lord when we come before Him. So he cut out two stone tablets like the former ones, and Moses rose up early in the morning and went up to Mount Sinai, as the LORD had commanded him, and he took two stone tablets in his hand. And the LORD descended in the cloud and stood there with him as he called upon the name of the LORD. Then the LORD passed by in front of him and proclaimed, “The LORD, the LORD God, compassionate and gracious, slow to anger, and abounding in lovingkindness and truth; who keeps lovingkindness for thousands, who forgives iniquity, transgression and sin; yet He will by no means leave the guilty unpunished, visiting the iniquity of fathers on the children and on the grandchildren to the third and fourth generations.” And Moses made haste to bow low toward the earth and worship. And he said, “If now I have found favor in Thy sight, O Lord, I pray, let the Lord go along in our midst, even though the people are so obstinate; and do Thou pardon our iniquity and our sin, and take us as Thine own possession. The Lord God who makes the covenant with Moses proclaims His own name to the prophet. Look again at verses 6 and 7. What wonderful attributes these are! How they encourage us to approach Him. Prayer “works” because this is who God is! But notice the reaction of Moses. He quickly worships God. Doubtless there was praise involved, since what is worship without praise to God? But then he asks God for what he wants, and what he wants is for God Himself to go with Israel. This is the first essential of prayer. We must go to God for God Himself. We must want to be in His presence and to be with Him. Whatever trying matters are pressing us at this time we should realize that the initial reason for prayer is relational. Left to themselves even Christians fall back into a spirit of independence, only coming to God when they need something from Him; when they need something fixed. This is a misuse of prayer. Not because we shouldn’t bring our requests before God—assuredly we should. But because prayer is communication between us and God it is nothing if it is not God-focused. “Hallowed be Thy Name; Thy kingdom come; Thy will be done” is, you recall, the first supplication in our Lord’s model prayer (Matt. 6:9-10). True prayer to God must indeed be to God. How often this fact is set aside by us in our rush to get answers. The answers are there, but never at the expense of the right relationship. There are two connections in prayer. The first is dial up and the second is broadband. Paul gets to the heart of prayer here. On the advice of a pastor friend some years ago, I did a study on the theme of seeking God starting with earliest references in OT. It's especially interesting when you get to the kings--who sought God, who didn't, what the difference looked like in their conduct. But the analogy has limits of course, as all analogies do. Dialup = very little actual data. Broadband = massive amounts of data all the time. .... I don't know. I think I'd probably look for a different analogy.